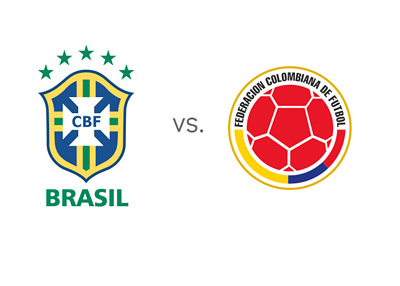 The second quarter-final match of the 2014 FIFA World Cup is Brazil vs. Colombia at Estadio Castelao in Fortaleza on Friday, July 4th, 2014. Brazil are coming off a penalty shootout victory vs. Chile, following an intense 1-1 draw after 120 minutes of play. A lot of people are saying that this Brazilian side does not look as threatening as it has in the past, but the truth is, Brazil are still undefeated on home soil in something crazy like 30-40 games. Colombia are the most dominant team in the World Cup up to this point. After topping their group with three wins, Los Cafeteros most recently beat Uruguay 2-0 in the Round of 16. The Colombian number 10 and the AS Monaco playmaker, James Rodriguez (22), is the star of the tournament so far. Despite Colombia's great form, the host nation, Brazil, are the favorites to win according to the odds. After all, the two teams have met twenty five times over the years, with Brazil winning 15 games and Colombia winning only two. The Friday match has the potential of being BIG. Will Neymar, Dani Alves and Julio Cesar be able to find the necessary form and outplay the high-flying Colombia, or will James Rodriguez and Jackson Martinez dazzle one more time and silence the local party. The kickoff is at 17:00 local time. The winner will play vs. either France, Germany or Algeria in the tournament semi-final.